Snow globes are a sentimental part of the holiday season. Shining, shimmering and bright, they bring a sense of wonder into the home. Miniature scenes within have a tendency to captivate children and adults alike. This year take some time to make a magical moment with a DIY project sure to shine. A simple mason jar, a little water and glitter go a long way when combined with a tiny tree-land design. It doesn’t take much to transform a sealed jar into a small wonderland of glittering snowfall. Easy to make and fun to shake, a Christmas mason jar snow globe will give your spirit a holiday lift with every upside-down turn. 1. Remove the lid from a mason jar and separate the small interior lid from the larger outer band. 2. 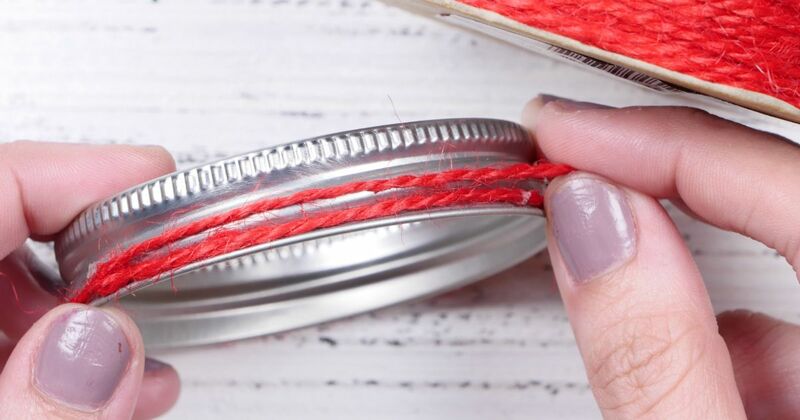 Attach the end of a piece of red yarn to the bottom of the large, outer band with a spot of hot glue. 3. Continue to loop and glue the yarn in a circle around the outside, completing five or six rounds until the entire outer band is covered in red yarn. Cut off any excess string. 4. Use a hot-glue gun to line the interior lip of the large outer band with glue and place the interior lid back in. Press to hold. 5. Arrange three toy pine trees in a triangle formation and attach one at a time to the interior of the complete lid using three small spots of hot glue. 6. Attach four cotton balls around the base of the trees like snow using hot glue. Stretch the tops of the cotton balls for a fresh-fallen effect. 7. Cut three small pieces of red yarn and wrap gently around each tree like a string of lights. Attach to the branches with small spots of hot glue. 8. Fill a small bowl with an assortment of gold and red crafting beads. 9. Place one small circle of hot-glue on the top of a toy pine tree. Use tweezers to place a single gold bead on top of the glue. Repeat for the remaining two trees. 10. Place small circles of glue in a pattern along the red yarn lining the toy pine tree. 11. Use tweezers to place beads on each glue dot. Repeat for the remaining trees and allow trees to dry. 12. Fill the bottom of the lidless mason jar entirely with glitter. 13. Pour water into the jar, filling to just beneath the lid line. 14. Turn the lid with trees attached upside down and screw gently back onto the jar. 15. Once completely sealed, turn the entire jar over so the trees are right-side up inside the jar.